What is collagen and do I need it? Collagen is the most abundant protein in the body, but it declines as we age. This naturally-occurring protein is in our bones, muscles, tendons, ligaments, skin, and cartilage. 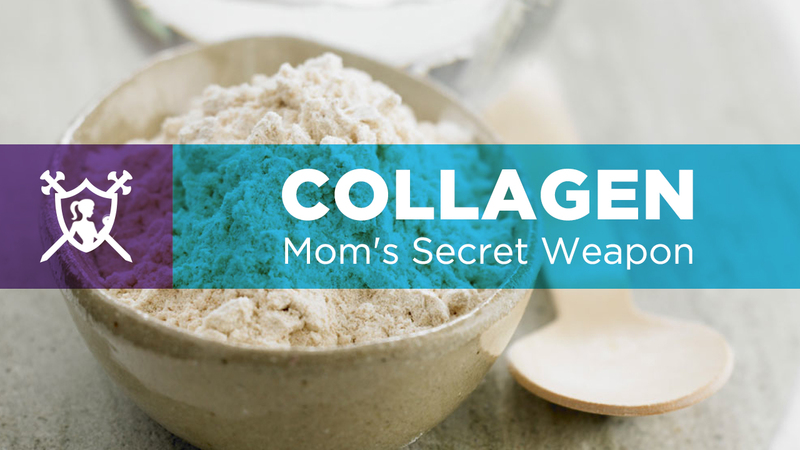 Collagen is every mom's secret weapon! Collagen gets a lot of attention for its cosmetic benefits. It is a natural form of skin care that improves the health of hair, nails, teeth, and our gums. It even results in firmer, smoother, renewed skin. By smoothing wrinkles and boosting elasticity, collagen means less cellulite and stretch marks. Hello, reverse aging! Collagen repairs the body. Not only does it reduce joint pain and degeneration, but it also provides the healthy, youthful body we crave so that we can live an active lifestyle. Bones are 90% collagen, so supplementing with collagen fights bone loss and osteoporosis. It lessens inflammation and, therefore, minimizes body pain. This means we minimize the intensity of post-workout soreness too! Collagen seals and heals by helping with leaky gut as well. Our gut is our biggest immune system organ. Leaky gut (or intestinal permeability) occurs when we ingest foods, bacteria, and toxins that leak through our intestinal wall and create an autoimmune reaction. Ever feel bloated, tired, gassy, crampy, or irritable from a meal? Collagen re-lines the gut to bring relief. As we improve our body’s digestive system, we effortlessly detox. Collagen boosts the metabolism and builds muscle because it supplies much-needed protein to our bodies. This means we not only have a strong, lean physique, but we also enjoy more energy. We stay fuller longer when we use collagen protein and avoid the growling stomach that can lead to poor nutritional choices (bye, cravings). It’s provides longer satisfaction than dairy protein powders, and is a great alternative to meat! Collagen can even help bring relaxation. It can improve sleep quality and it calms our brain and balances our moods (thanks to the long-chain amino acid, glycine). Life can create anxieties and that adrenaline response, but supplementing with collagen naturally calms these negative reactions. The great news is, collagen is like that friend that happily mingles with everyone. It mixes well and is easy to take. You can buy collagen powder and add it to your protein smoothies. Bovine collagen (also known as bovine cartilage or beef collagen) is a natural protein found in the cartilage, bones, and hides of cows. This type of collagen is very similar to what we have in our bodies and replenishes what our bodies lack. The thing is, not every collagen brand is pure. And who really wants to remember to add it to a protein smoothie every single time? The ideal way is to get a protein powder that already has collagen mixed into it. It’s tasteless and odorless, so it’s easy to incorporate into your daily nutrition. And here’s the best news! MOMSANITY has created a COLLAGEN protein powder: MOM FUEL! We want you to look and feel your very best! We designed MOM FUEL collagen protein powder to give you the most complete form of protein in the most convenient way possible! Get all the benefits of collagen and plant-based protein in just one scoop per day! It’s perfect for shakes and baking! Get your MOM FUEL Protein Powder HERE!